Red-dotted line is currently South Main Avenue. 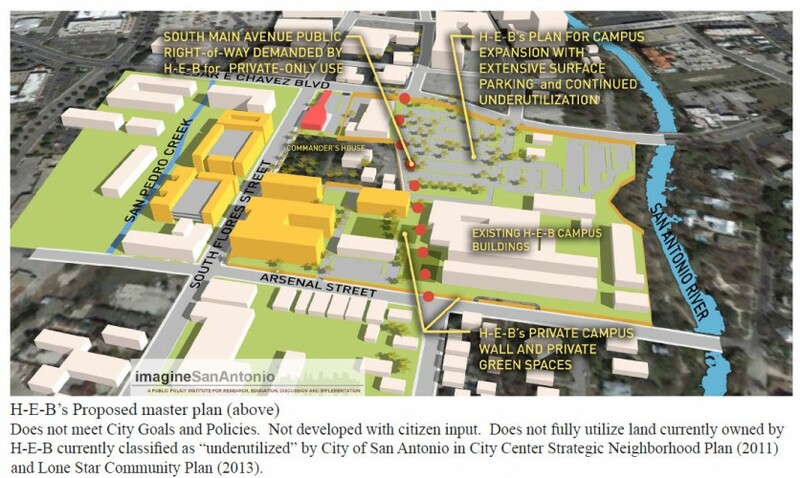 The entire northern half of the soon-to-be superblock is “planned” to remain underutilized and auto-oriented – this on the side facing downtown San Antonio. Iris Dimmick, of the Rivard Report, wanted to speak to me after planning commission vote, and her article, “H-E-B Proposal Clears Planning Commission, Moves to City Council” is in the link to the right with some excerpts below in the grey box. First, here’s a little background and a curt summary of where things stand. I made presentations to the zoning commission on Tuesday and to the planning commission on Wednesday. I emphasized the fact that the proposed plan by HEB does not comply with the relevant community-input land use plan. “High-Density Mixed-Use” is the community vision, per the Lone Star Community Plan. Bob Wise spoke and presented the win-win solutions from imagineSanAntonio per his article in the Rivard Report. Zoning commissioners voted unanimously to allow, with a special use authorization, a gas station in the “Downtown” zone, against the land use plan. Like dominoes, and against the City’s 2011 Strategic Framework Plan, planning commissioners voted unanimously to declare as surplus, and to abandon, the public right-of-way South Main Avenue, dismantling the potential of this thoroughfare to become a complete street and to connect to other complete streets. City Council cinched the deal on Thursday, voting to support HEB corporation’s plan to create a huge superblock in downtown San Antonio. Per their proposed plan it will have a new gas station and store with surface parking lots on its (otherwise potentially) most urban, north-east corner. This new privately-owned parcel will be almost twice as large as any other major American city’s largest superblock! Architect and urban design professor David Bogle pointed to the Lone Star Community Plan’s call for “high density mixed use” at the sites of the proposed grocery store and current H-E-B employee parking lots. via H-E-B Proposal Clears Planning Commission, Moves to City Council | The Rivard Report. Posted in architecture, blog, events, urban. RSS 2.0 feed.